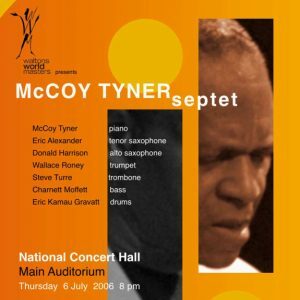 here’s a nice show from the national concert hall in dublin that i recorded off the air & seeded on dime in 2007. it’s a great show, and very well recorded but wasn’t so good for folks who actually attended. the jazz alley show on rté has been dropped in my absence, which is really too bad. finally, a shout out to the fine folks at waltons music and the waltons new school of music (where my daughter studied piano until we moved away). this was one of the waltons world masters series, and their support for that series (and this show) is appreciated. cover by pete, using a screenshot of the concert poster (downloaded from the waltons new school website, and used without permission).